Pork specialties come in many different forms, including sausages, blood pudding, bacons and hams in each valley and local culture. Pigs, an essential part of the livestock, have long improved mountain tables. For years, pork products were not well known beyond the immediate circle of family and local consumption. 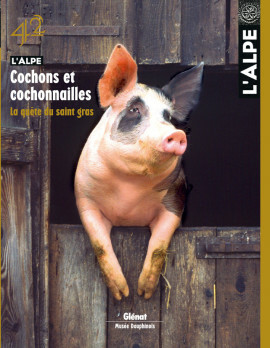 But today, the wonderful taste of Alpine pork is spreading to wider areas. Pork butchers owe everything to pigs and the reverse is true too. But they must love fat… In the Savoy, Bruno Revel does. From the initial breeding to the sale of home-made delicatessen, he continues to study taste and quality. At a time when ancient crafts and know-how are fading away, his efforts to resist standardisation are a source of joy for those who love good fat. Pigs from the Provence mountains love acorns and were willing to travel far and wide during the Middle Ages. They undertook true transhumances to find well stocked oak trees, even if that occasionally meant trespassing. The years without good acorn crops tended to be bloody ones, as is made clear in the unpublished archives at Forcalquier in the Hautes-Alpes department. Curly-hair hogs are even tempered, easy to raise and excellent tasting. Like many other breeds, they nearly disappeared but are now making a come back. In Switzerland, breeders are attempting to promote the animals, an essential condition for their survival. It is a long-term effort because those hairs on their backs are not exactly a golden fleece. In the Piedmont, as elsewhere, pork is part of many different dishes, including some solidly rooted in local traditions. That is certainly the case of tofeja, a stew of beans and pig rind that took on the name of the earthenware pot used for cooking. A very typical dish, in terms of both the recipient and the food itself. Chef, comedian, poet… In his solitary retreat in La Rochette, near Pontcharra at the very southern end of the Savoy, Philippe Roman attempts to combine good writing with good food, the theatre with cuisine. He prepares his chitterling sausages and produces rhymes on pigs. What a way to live a life. More cow or pig ? In the Swiss Alps, definitely cow country, pigs are not yet truly part of the culinary tradition. An inventory of Swiss cuisine shows that beef still remains, in many regions, the basic ingredient of the most famous dishes. But the latter would not be quite so tasty without some… pig fat. High-altitude pigs exist, we have seen them ! A traditional part of beef and cheese production, the pigs, fed the whey not used for cheese, are a living heritage that could well disappear due to regulations and gains in productivity. A very discreet, home production still exists in the Savoy for the great pleasure of a small number of connoisseurs. But for how long ? The Swiss photographer, Vanessa Püntener, spend several seasons in the summer pastures of the Uri canton, in the very heart of the Swiss Alps. Portraits, landscapes and daily activities together form a heartfelt vision of a world outside our modern civilisation, a traditional lifestyle that may now seem obsolete, but that silently continues, year after year. The Italian writer, Mario Rigoni Stern, died on 16 June 2008 in Asiago, Venetia, on the high plateau where he spent almost his entire life. Profoundly influenced by the mountain region and by the war, he produced some 20 works that speak of the cruelty of the battles, but also the beauty of nature, brotherhood and the life in the mountains. A powerful and poetic lifework, widely recognised, and an appealing person, presented here by his translator. The agri-food industry came into being during the second half of the 1800s, thanks to a handful of pioneers. Jules Maggi of Switzerland was one of the innovative entrepreneurs. By creating healthy, inexpensive soups that were easy to prepare for the working classes, he contributed to a radical change in eating habits. A shift toward « factory cooking » that is presented in an exhibition at the Alimentarium in Vevey, Switzerland. Mechanical structures to send information through the air ! The invention of the first telegraph by Claude Chappe at the end of the 1700s revolutionised communications. The Paris-Milano line sprang over the Alps via the Haute-Maurienne valley and the Mont-Cenis pas, where enthusiasts have located the vestiges of the transmission stations and their daily life. A Swiss village has a surprising gold mine. The inhabitants of Mund, in the Haut-Valais, have restarted a very old local production, that of the small purple flower from which saffron is extracted. A legendary spice worth its weight in Swiss francs, but whose true value lies in the notoriety it has earned for the village. More than a flower, it is a heritage and an identity that the Swiss are cultivating.